As we start reading Wikinomics, I find the news full of stories about collaboration and prosuming. In 1980, futurist Alvin Toffler coined the term “prosumer” to describe the type of work new technologies would enable us to do. 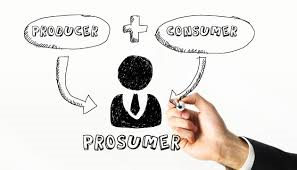 Prosumers produce and consume the information marketplace. Or, that they actively participate in the creation new idea, products, and entertainment. While this idea was radical in the 80s, prosuming is commonplace today. Entertainment franchises like The Matrix and Supernatural use consumer input to create storylines, build their worlds, and generate support for their shows. T-shirt shop Threadless asks consumers to rate and sometimes submit designs. What’s more, is that more and more of our news comes from prosumers. In “How YouTube Changed Journalism,” Atlantic writer Matt Schiavenza suggests that YouTube is direct conduit between people who create/experience news and consumers. Some people claim that more direct involvement will democratize the news. If we can all participate in the message, somehow we may find more accurate and unbiased news. However, as Schiavenza points out, this idealism maybe too simple. He cites Evgeny Morozov who warns against believing in cyber-utopias or the power of the internet to democratize the world. I feel like I should note that I cited Morozov in my dissertation and I am sympathetic to his claims. Capturing a video does not mean justice will prevail. In fact, organizations like ISIS use YouTube and other video sites to share their extreme message and show violence. In other words, maybe we need to be cautious about claims that being a prosumer means democratizing our information. Or, that collaborative creation always means more accurate stories and reporting.